For those of us who harbour “absolute certainty” about anything – in particular about issues with little or conflicting evidence. He explained how the nature of people made such inflictions possible. Over the last fifty years the evil inflicted involved exploitation of a new and necessary idea – environmentalism and its subset global warming. Hierdie goed is gevaarliker as kernkrag! Not the first time …. The online SVZ here reported yesterday on a wind-turbine construction accident occurring in Southern Germany. Workers of the Hamburg-based Nordex company were operating a large hoisting crane by remote control as it lifted the 60-tonne wind turbine rotor assembly for mounting onto the 200-meter tall tower. At 60 meters height the entire assembly came crashing down onto the earth below. According to an eyewitness, a gust of wind may have caused the rotor to strike the tower before falling. 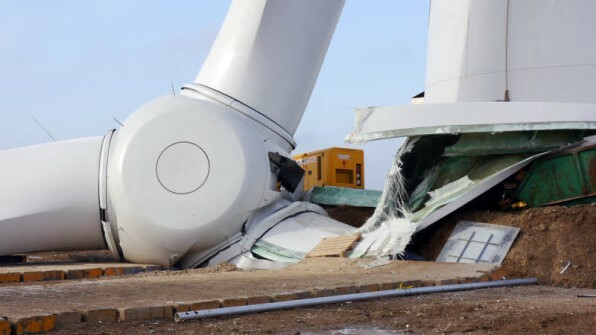 The SVZ reports that the impact likely caused irreparable damage to the structure’s foundation, and so the entire turbine unit will have to be rebuilt complete from scratch. Damage is estimated to be in the hundreds of thousands of euros. No one was injured. Wil jy deel wees van hierdie “kultuur”? Dink jy dit moet behoue bly? Nie vir my nie, dankie. Vuurklip bak nou al jarre en jarre sy eie brood – maar nog altyd met winkelgis. Hier is die eerste geslaagde poging sonder winkelgis of enige ander byvoegsels. Net meel, water, sout en geduld. Die eerste paar pogings was volgens verskeie internet resepte maar het liederlik gefaal en moes asblik toe. Vuurklip het toe sy eie kop gevolg en voilà! Ms Tina Joemat Petterson, Minister of Energy Affairs. Mr Donald Trump, Minister of Energetic Hairs. … val nie vêr van die boom af nie!